It’s football season and that means tailgating. Now, I’m more partial to hockey, myself, but I certainly have an appreciation for tailgating chow! And since I’ve started making my own slider buns, I have a whole new appreciation for sliders! Small, compact, two bite burgers – all the joy of eating 3 burgers with none of the gluttony! 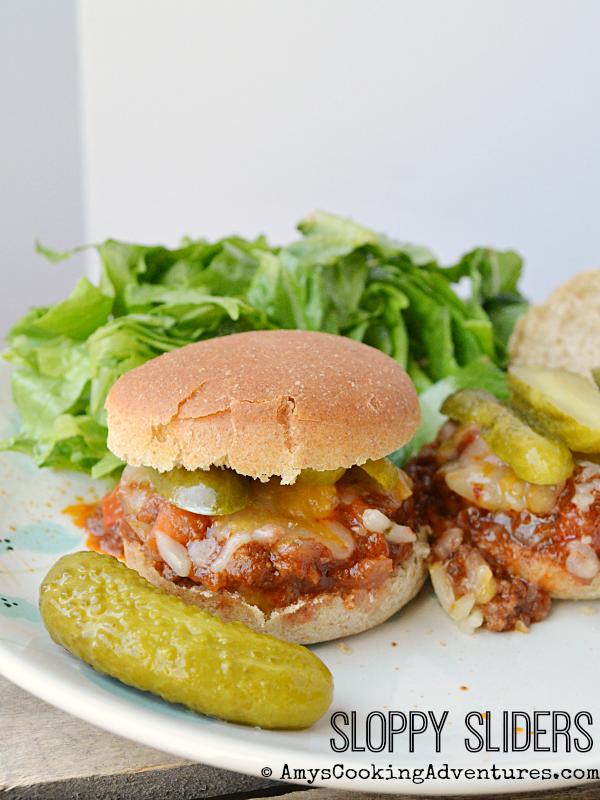 This time around I added some homemade sloppy joe mix to the sliders – along with cheese and pickles, of course! They were absolute perfection! Place the beef, onions and red pepper in a skillet and cook until the beef is browned and the onion is tender. Add the remaining ingredients and stir until combined. Simmer until the sauce thickens (about 5 minutes), then taste and add salt & pepper, as desired. Heap the sloppy joe mix onto the sliders and top with cheese and pickles.